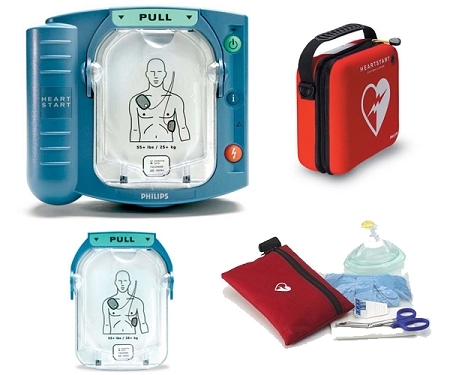 Philips' HeartStart OnSite AED has dominated the market of inexpensive and easy-to-use defibrillators since its launch. The first commercial defibrillator available without a prescription, the Philips HeartStart OnSite AED is the smartest choice for anyone looking to increase their preparedness in their home or office while keeping costs down. 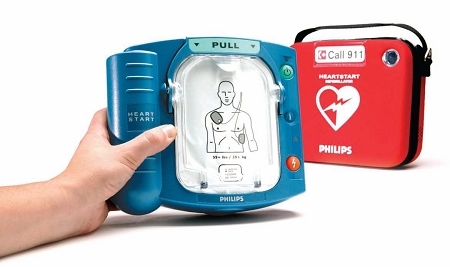 The Philips HeartStart OnSite AED has numerous features that set it apart from competing models. The design and construction of the Philips HeartStart OnSite are nearly perfect. Both incredibly small in size and light in weight, the HeartStart OnSite AED weighs only 3.3 pounds. When a rescue scenario forces you to travel distances to your victim, this feature of the HeartStart OnSite you'll come to appreciate and praise. The Philips HeartStart OnSite AED is also one of the easiest - if not the easiest - defibrillators to administer therapy with. As we all expect, the HeartStart OnSite AED features voice prompts, providing clear voice instructions to the responder that guides users through each and every step of defibrillation and CPR. Simply pull the HeartStart OnSite's green handle to activate the AED and the HeartStart OnSite AED will guide you from start to finish. For an untrained layperson forced to respond to a situation of sudden cardiac arrest, this simple feature of the Philips HeartStart OnSite AED could very well be the difference between life and death. The Philips HeartStart OnSite AED can also determine if a heart rhythm is shockable. If a shock is indicated, the HeartStart OnSite AED will direct you to press the Shock button, which conveniently flashes orange. The OnSite AED will then deliver a low-energy dose of biphasic therapy, the preferred therapy of rescue personnel that is both gentle to the heart and highly-effective. If a shock is not needed and CPR is the recommended therapy, the Philips HeartStart OnSite AED will instruct you via voice prompts and instructions. Not only does the Philips HeartStart OnSite provide the usual instructions for recommended CPR therapy, the HeartStart OnSite AED even provides unique information such as frequency and depth compressions and the administering of breaths to the patient. There is also maintenance of your defibrillator, and, as always, Philips has you covered. The HeartStart OnSite AED administers self-tests on a daily, weekly and monthly basis. From checking electrical components, subsystems, battery life and more, to verifying that the pads cartridge is properly installed and in working order, the Philips HeartStart OnSite AED ensures you're ready for situations of sudden cardiac arrest. Convenience and the finest in medical technology also extends to the cartridges used by the Philips HeartStart OnSite AED. Featuring replaceable SMART pads cartridges, the cartridges for the HeartStart OnSite AED are some of the most advance on the market. The two adhesive pads are able to sense and record when they're removed from the cartridge and placed on the patient's bare skin, adjusting its voice prompts and commands accordingly. The Philips HeartStart Onsite AED can also be used on patients of any age. 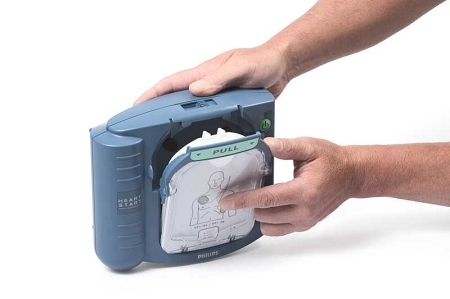 The HeartStart OnSite AED is able to sense when the infant/child SMART Pads Cartridge is installed and automatically adjusts the energy level for infants and children, while also providing unique CPR coaching for children and infants. You can also prepare for those stressful situations with your Philips HeartStart OnSite AED by installing the training pads cartridge. The Philips HeartStart OnSite AED will suspend all shock therapy while the training pads cartridge is installed, in addition to walking you through various patient care scenarios. 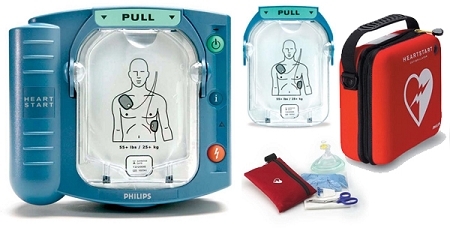 The Philips HeartStart OnSite AED also features Philips' patented Quick Shock. Taking note of findings from the American Heart Association Guidelines, which reported "reduction in the interval from compression to shock delivery by even a few seconds can increase the probability of shock success," Philips developed their Quick Shock technology that places the HeartStart OnSite AED as the fastest defibrillator in its class for delivering a shock after CPR. Seconds may not sound like much, but we guarantee that in a potential life or death situation, every passing second will be experienced and a matter of seconds may very well can be the deciding factor of the survival for a victim of sudden cardiac arrest. Our bottom line, the Philips HeartStart OnSite is a fantastic AED for the home and office, one that can easily be used by the trained responder and those with little to no experience whatsoever. 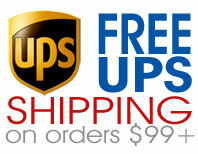 The Philips OnSite is small, lightweight, features clear and easily understood voice prompts, and more. If you're in the market for an affordable defibrillator that can be used by just about everyone, the Philips HeartStart OnSite AED represents a wise choice.